IKEA SPOTTER: Thankfully thanking those who give thanks and turkey. Thankfully thanking those who give thanks and turkey. 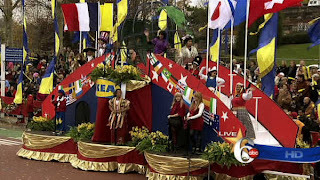 Did you know that IKEA sponsors the Thanksgiving Day parade in Philadelphia, PA? At least since 2008. That is so....awesome. And weird. They sponsor a couple different floats and balloons but this is the only IKEA theme I could find. For most Americans today is a day where we reflect on the things we are thankful for and eat a ton of turkey. There is historical significance to this tradition although lately it just seems like a feast day to load up on reserves for the hours of waiting in line and shopping tomorrow. I'm not a shopper but that won't stop me from loading up on all the trimmings. There a things that I am thankful for and one of them is you. I love checking the blogger stats to see who has visited this blog. I can see page views, traffic sources and country of origin (Hello, Germany. Hello, Australia. Hello, Latvia. I had to look you up on the map but I'm glad you stop by!). Even though I don't hear from you I know you are there and that makes me very happy. Thank you for supporting my pet project. I hope that you are finding it informative and maybe a little entertaining. If you find yourself spotting things in the TV/Movies you are watching and your spouse, dog (rabbit) or imaginary friend is tired of hearing you send me an email. I am always glad to get help with the content I post. I would give you many thanks. I hope you have a wonderful day - unless you are these guys. Turkey gang outside my kitchen window. Happy Thanksgiving, Amanda! Your posts always make me smile!